Amazing news this morning! 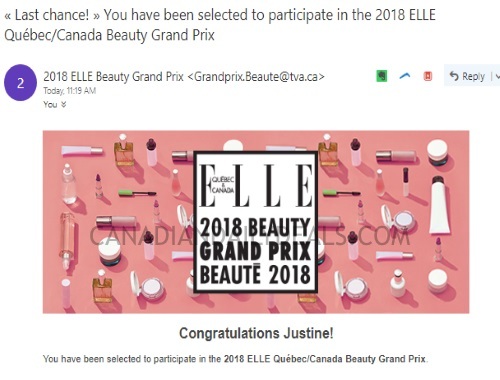 I was chosen to be one of the jurors in the 2018 Elle Beauty Grand Prix! I will be blind testing several products submitted by well-established beauty companies. Look carefully if you got this email as mine was marked "last chance" and I have to confirm my participation before January 15, 2018 (I saw the email today) or my position will be offered to another reader. To confirm click on the link in the email to confirm your participation and address where your products should be sent. You will receive the products you must test and related information on or about March 12, 2018. You will have until June 1 to test and evaluate the products. You must complete and submit your logbook by June 8th, 2018. Were you chosen for this too? Please let us know on our Facebook Page here. Click here to read our original post about this campaign.